Following the official IMAX poster released yesterday, Walt Disney Pictures has debuted four character posters for their upcoming adventure Tomorrowland. George Clooney (Frank Walker), Britt Robertson (Casey Newton), Raffey Cassidy (Athena) and Thomas Robinson (Young Frank Walker) are featured in these new one-sheets for director Brad Bird's upcoming adventure. We don't know much about Athena and Young Frank Walker quite yet, but hopefully we'll find out more about these characters as we get closer to the May 22 release date. 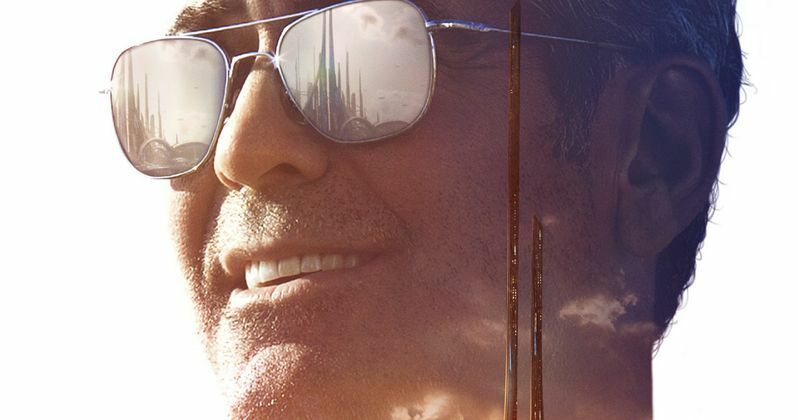 From Disney comes two-time Oscar winner Brad Bird's riveting, mystery adventure Tomorrowland, starring Academy Award winner George Clooney. Bound by a shared destiny, former boy-genius Frank (Clooney), jaded by disillusionment, and Casey (Britt Robertson), a bright, optimistic teen bursting with scientific curiosity, embark on a danger-filled mission to unearth the secrets of an enigmatic place somewhere in time and space known only as Tomorrowland. What they must do there changes the world-and them-forever. Featuring a screenplay by Lost writer and co-creator Damon Lindelof and Brad Bird, from a story by Lindelof & Bird & Jeff Jensen, Tomorrowland promises to take audiences on a thrill ride of nonstop adventures through new dimensions that have only been dreamed of. While we don't see them in these posters, the supporting cast is rounded out by Judy Greer, Kathryn Hahn, Hugh Laurie, Tim McGraw, Keegan Michael Key, Lochlyn Munro and Pierce Gagnon. Take a look at these new character posters below, and stay tuned for more on Tomorrowland, before it hits theaters next month. Related: Tomorrowland Clips: George Clooney Vs. Killer Robots!